Simply it's a steampunk-themed reskin of Geartrooper's Ironsnout x10k playermodel. You can download the playermodel reskin here. You can download Ironsnout's Steampunk Rifle reskin here. INSTRUCTIONS (For Snout): Like my other reskins, simply download the zip, extract it, and replace the existing snoutx10k (under sauerbraten/packages/models/) folder with the extracted one. INSTRUCTIONS (For Rifle): simply replace the rifle folder (directory sauerbraten/packages/models/hudguns) with the extracted rifle folder. To be honest, your mistake here is using the visible clockwork parts on places where the body is moving, like the waist and hand/leg joints, which looks silly. But otherwise, i like the idea and the end result seems very nice! 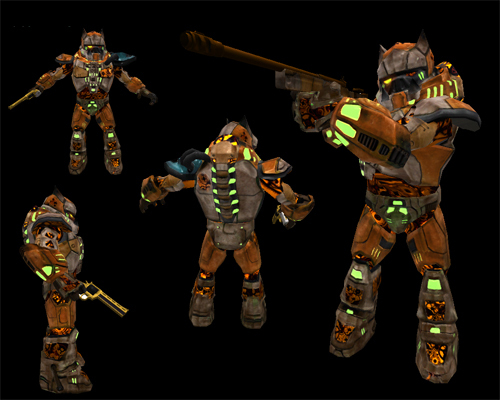 I suggest playing with the clockwork colors a little (too much orange) and maybe darken them a bit too. Colour scheme: Copper is orange, and Iron is either dark grey or different shades of red (when oxidized). Plus my overuse of bright orange was to simulate internal combustion heat, as if the body was a boiler like a steam locomotive, or those Amish steam tractors. My inspiration came from the Hellboy characters, Karl Ruprecht Kroenen, Johann Kraus, & The Golden Army Soldiers (Characters are property of Dark Horse, respectively). Thanks for commenting though, how's the rifle look? You guys are missing the point of my complaint. It's not the fact that the gears are placed in the joints the problem, but the whole stretching they undergo when they move that looks weird. Bahh.. we don't need to be critical all the time. You carry a valid point but.. it's.. it's.. a game. Properly repacked for easy installation, merge with packages in your custom content folder.